Express Yourself with Photos & Videos! Photos and videos are meant for enjoying and sharing. But with so much content that we capture, upload, download and share, it's hard to find the right photo and keep track of it all. Until now. MediaShow was specially designed to make managing your media virtually effortless. Arranging, fixing, creating polished slideshows and movies, and sharing your photos and videos is fast, fun and easy! Best of all, MediaShow 6 now supports 3D! Taking photos and videos is so easy these days that most of us capture media faster than we can organize it. The result is that many of us are left with growing piles of unnamed, unclassified photos and videos. MediaShow helps you take back control and remove the hassle from organizing your photos and videos with easy sorting options by date, event or people. You'll never have to spend hours searching for photos again. Using the timecode stamped on your digital media, MediaShow automatically organizes your photos and videos into a calendar by the date it was shot. Want to find those photos from last Halloween? Double click on the date and view all the photos and videos that were taken on that day! MediaShow 6 features a new album content slider that lets you preview all the media in a folder-without having to open the folder so you can search for a particular video or photo in seconds. You can even do smarter searches by selecting a photo in your settings to represent an album.. Got a photo that really captures the theme of the album? Set it as your album cover to make future searches for the set easier. MediaShow's cutting-edge FaceMe™ Technology sifts through your photos to accurately identify faces with amazing precision, even if they're slightly covered or out of focus. FaceMe™ can even identify people wearing sunglasses or shot at various angles. MediaShow makes it fast and easy to search for people using their name tag. With the advanced People Search icon, you can choose from your existing group of tagged friends. It's easy-just type in the person's name or click on the image of the person you're looking for and MediaShow will locate every photo that the person appears in. Sorting your photos and videos into meaningful groups is easy with MediaShow's tagging function. With just a right click, you can select a category for your shot from the 6 popular tag labels such as family, holiday, party and more, or create your own unique tag. Even if you don't get the ideal footage every time, you can edit your videos to perfection with tons of easy, one-click tools from MediaShow. It's like having a party with your all your friends! The new Facebook tab in the Media Library lets you see photo albums from all your Facebook friends in one place. No more clicking on friend profiles and waiting for pages to load--now all your friends' photos are a single click away. 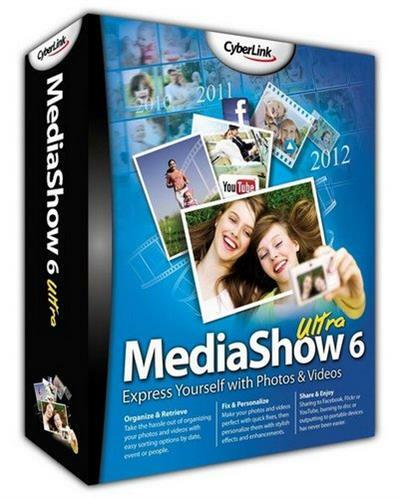 Plus, if you want to save some Facebook photos to your PC, MediaShow lets you download them in a batch to save time. - Fixes the issue that users cannot browse to Facebook friend's media.